In this series of posts, I am going to create a clone of the classic arcade game, space invaders, in C++ using only a few dependencies. In this post I will set up the required OpenGL shaders to draw an alien sprite! The GPU is good at performing operations on lots of data. The trade-off being that programming the GPU is not as easy as programming the CPU. 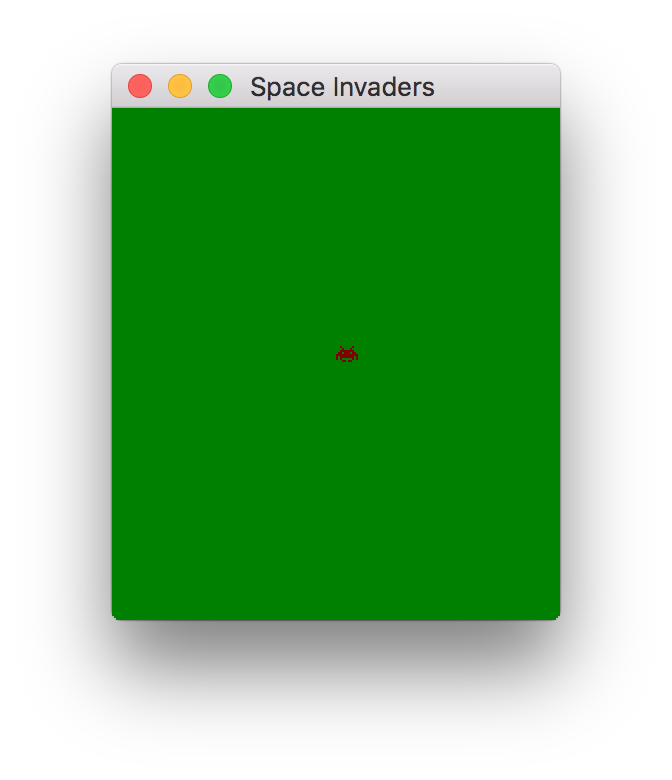 For the simple space-invaders clone I'm building here, it's easier to just render everything on the CPU using a buffer, i.e. a chunk of memory representing the pixels on the game screen. The buffer can then be passed to the GPU as a texture, and drawn to the computer screen. The function iterates over all the pixels and sets each of the pixels to the given color. This will create a buffer of buffer_width width, and buffer_height height, and will set the color to the clear_color, i.e. green. Having created the buffer, we now need to setup OpenGL to be able to display the buffer on screen. In Modern OpenGL, most responsibilities have been transferred from the OpenGL driver to the user who has to write programs that are executed by the GPU. These programs are called shaders. Furthermore, OpenGL defines a rendering pipeline, and shaders can execute at different stages of the pipeline. Legacy OpenGL is also called "fixed pipeline" because the stages of the pipeline are not programmable, but fixed. The two most important type of shaders are the Vertex and Fragment shaders. Vertex shaders handle the processing of vertex data. Most commonly, they are used to transform objects to screen-space coordinates. After several stages, the primitives that were processed by the Vertex shader, are rasterized. At this stage, the fragment shader processes the fragments generated by rasterization. Fragment shaders can output a depth value, a possible stencil value, and color values. Vertex shaders and Fragment shaders are the only shaders that are required by the rendering pipeline to function. Although you can make beautiful things with shaders, here we will build a pair of simple shaders that will output the contents of the buffer we created in the previous section.
" TexCoord.x = (gl_VertexID == 2)? 2.0: 0.0;\n"
"    TexCoord.y = (gl_VertexID == 1)? 2.0: 0.0;\n"
"    gl_Position = vec4(2.0 * TexCoord - 1.0, 0.0, 1.0);\n"
"    outColor = texture(buffer, TexCoord).rgb;\n"
Roughly, VAOs are a kind of structure in OpenGL, that stores the format of the vertex data along with the vertex data. Finally, the two shaders need to be compiled into code the GPU can understand and linked into a shader program. Here, we specify that the image should use an 8-bit rgb format to represent the texture internally. The last three parameters of the call to glTexImage2D specify the pixel format of the data we pass to the texture; each pixel is in the rgba format and is represented as 4 unsigned 8-bit integers. The two first glTexParameteri calls tell the GPU to not apply any filtering (smoothing) when reading pixels. The last two calls tell it that if it tries to read beyond the texture bounds, it will use the value at the edges instead. the contents of the window that gets created should be green. We already created a window and displayed some color on it in the last post. Ending this post with the same result would be a bit boring, so let's draw something. The function just goes over the sprite pixels and draws the "on" pixels at the specified coordinates if they are within the buffer bounds. Alternatively, one could represent the sprite in the same way we defined the buffer, i.e. each pixel being a 32-bit rgba value, with the alpha value used for transparency/blending. If you compile and run the final code of this post, here, you should see a red texture in the middle of a green background. In this post, we set up some plumbing so that we could draw sprites on the CPU and display them on the window we created in the last post. In modern OpenGL this is quite some work, as we touched vertex buffer objects, shaders, and textures. Having set our drawing routines, we can now start focusing on more exciting things, such as programming the game logic.